On the best of days, single fatherhood is an adventure. On the worst, well, it can be a circus and you’re the clown. Speaking from experience, there have been a handful of days during the past several years that I was one digit on my telephone from self-commitment to the circus. Juggling the responsibilities of parenthood, like homemaking, breadwinning, social scheduling, lawn mowing, clothes shopping, educational consulting, sports coaching, taxi driving, role modeling, meal cooking, and advice giving are regularly more than enough to keep a guy’s hands full. When the single dad already has a dozen balls in the air, but then someone unexpectedly tosses-in the figurative burning torch or running chainsaw and causes everything to fall to the floor, well, it’s just about enough to make a guy want to run away and join Barnum & Bailey. 1. No Changing Station in the Men’s Room– You’re at a restaurant having dinner with your family and your littlest kidling needs a diaper change. Armed with your diaper bag, you take the little tot into the men’s room, and, voila, no changing station. You’re tempted to find the nearest empty table in the dining room, lay out the changing pad, and do the business right next to the party of twelve whose entrees are just being served. One way or another, you probably won’t be a repeat customer. 2. The Fragile Teacher – Let’s say there’s been an issue involving one of your kids at school and you’re not satisfied with how the teacher resolved it. It could be anything from how she handled an altercation involving your child to your belief that the teacher is “teaching to the test” rather than to your child. You make arrangements to speak with the teacher about your concern. While you’ve had an otherwise good relationship with The Fragile Teacher and while you remain calm, relevant, and reasoned, she perceives you as a bully and becomes defensive and, perhaps, even gets emotional. Jeez! 3. The Indignant Mother – More of a downer than any sort of impediment to your practical ends, but a peeve nonetheless, The Indignant Mother is usually an acquaintance, a coworker, a friend of a friend, or even family. She has her own children, may or may not be married, is miserably unhappy, and can never end a conversation without letting you know how much better your children would have been with a woman in the house. Smiling all the while, she’ll also offer unsolicited advice about your haircut, the way your kids dress, and the car your drive. Obviously, you do your best to avoid The Indignant Mother when you can, but there are times when contact is simply unavoidable. 4. The Clueless Parent – Because your children's friends are your children's friends, The Clueless Parent tends to be a repeat offender. Imagine one kidling needs a ride to a soccer game. You have just enough time to drop off before you taking another child to the school play. Your razor-sharp schedule is predicated on a punctual pick-up of your third from the sleepover birthday party. You'd already explained the importance of the pick-up time to The Clueless Parent(s) who hosted the sleepover, but, when you arrive ten minutes early, the kids haven’t gotten out of bed, much less eaten the super-special birthday breakfast that your child just can’t miss. 5. Party Hearty Marty –If you still have any of these, your Party Hearty Marty’s have never really matured past age 16 and are the same guys who, after you got married or started your first job, still wanted to go out every weekend (or weekday), get loaded and chase skirt. Frankly, there may be a time for chasing skirt and the occasional cocktail isn’t such a bad thing, but you just can’t do the same things you did B.K. (before kids). Like The Indignant Mother, Party Hearty Marty is akin to ants at a picnic: he may be a nuisance, but he won’t stop you from having your picnic. Unlike The Indignant Mother, however, Party Hearty Marty can be avoided or will usually stop bugging you after hearing, “No,” a few times. 6. Late People – Writer, E.V. 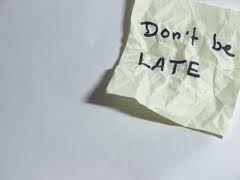 White, once said, “I have noticed that the people who are late are often so much jollier than the people who have to wait for them.” Time is the single father’s most valuable resource and, if wasting is a sin, there’s no greater sin than wasting the single dad’s time. Whether you have an appointment for check-up’s with the pediatrician, a plumber or electrician for a home repair, or anyone else, a professional who doesn’t have the respect for you to be on time doesn’t deserve your business. Some peeves you may never be able to molt. If your sister or a coworker is The Indignant Mother in your life, well, you can’t choose your family or the people you work with. If one of your children has The Fragile Teacher, you’re probably stuck, at least until next school year. On the other hand, there’s quite a bit you can do. If a restaurant doesn’t have a changing station in the men’s room, then spend your money somewhere else. You can choose your friends; tell Party Hearty Marty you can’t go to the bar for Monday Night Football because you have to get your kids on the bus on Tuesday morning. As for Late People, well, just fire them. If someone else wants your business, he or she will be on time. If not, there are others who will be. With any luck, you may even be able to avoid joining the other clowns.